The next three chapters in this book will demonstrate various methods of customizing the CSK. Every community site will have different requirements to fulfill. Although the existing CSK framework offers a great deal of flexibility, having the entire source code available means you can add additional functionality to a site in an elegant manner. In this chapter, we will concentrate on creating a new module for the CSK. We will see how creating a new module allows you to add entirely new features which integrate seamlessly with the rest of the framework. In this chapter, we will implement a Frequently Asked Questions (FAQ) module. Before we begin, let's mention one caveat. The CSK is a living piece of software. It will undoubtedly gain additional features and modules from the developer community, so one question you may want to answer is, "Has someone else already written the module I need?" Once you've made the commitment to customizing the CSK with your own code, you'll need to also think about integrating your code into newer versions of the CSK. If you stick to the current design used by the existing modules, chances are you'll find that the upgrades are easier. Before you begin implementing a new module for the CSK, you will first want to have a firm grasp of the features you wish to add, and then decide if any of the existing modules shipped with the CSK can fulfill that functionality. An FAQ should consist of a question, an answer, a description or introduction, and pointers to additional references. Community users should have the ability to comment on and rank individual FAQs, as well as offer e-mail notifications when a new FAQ appears. Community users should have the ability to submit a new FAQ subject for the moderator's approval. You could certainly create a list of questions and answers marked up in HTML and add the content to a community site using the HTML Page section type. However, the HTML Page section type offers limited user interaction (no comments, ranking, e-mails, or moderation). Alternatively, the Articles section type could provide us with what we need, if we are willing to lump the FAQ answer and reference fields together in the article's body text. For maximum flexibility in presenting information, we would prefer to keep these as distinct entities. With our requirements and direction set, let's take a look at the classes and tables we will be building. We can then build a class to hold FAQ information. 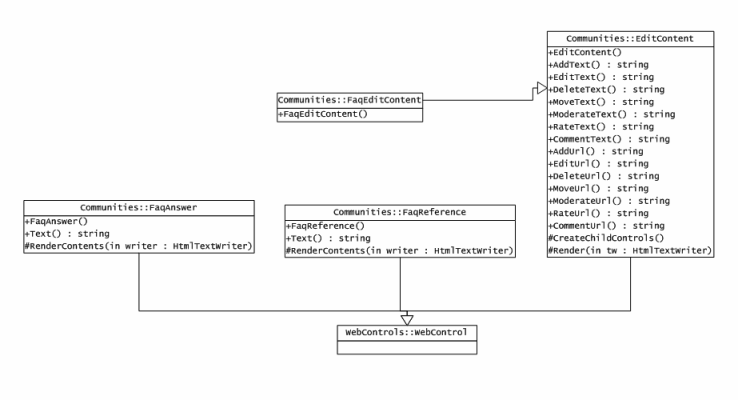 As shown in the following diagram, the FaqInfo class inherits from ContentInfo, which holds most of the attributes for any content item. Every module also uses a utility class to retrieve, add, and edit content. For the FAQs module, this is the FaqUtility class (shown without method parameters). The CSK caches data from Community_NamePages so as to retrieve the data only once. If you make modifications to the table, you'll need to restart the web application for the changes to take effect in the CSK. The maintenance stored procedure also needs to register the named pages (static content) for the new module. 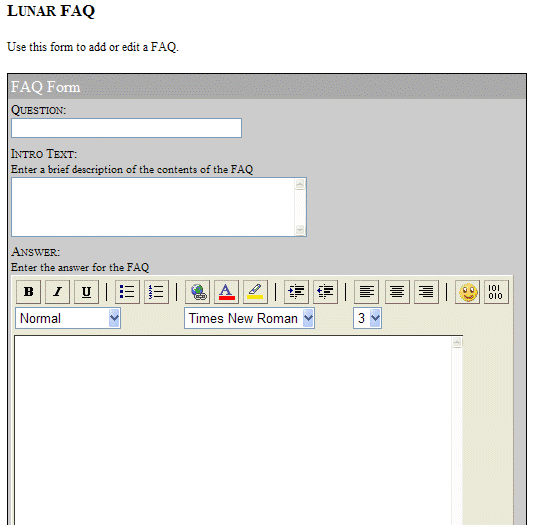 Named pages for the FAQ section will include the page to add an FAQ and a page to edit an FAQ. You'll have to choose your page names at this point and use the same names later when you create the ASPX file. The namedPage_pageContent parameter is the name of the class that the CSK will instantiate as the code-behind logic for the page. 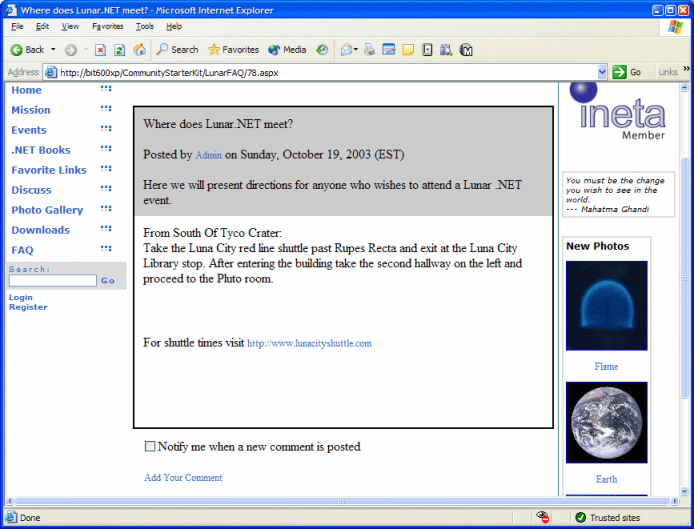 The name includes the full namespace qualifier ASPNET.StarterKit.Communities.Faqs.AddFaq. The maintenance stored procedure needs to execute during the database setup. We will take a look at how to do this in Chapter 11. The C# code for our FAQ module will reside in the Engine\Modules\Faqs directory. First, we will write out helper components and place these in a Components directory. Each module in the CSK places components inside a distinct namespace below ASPNET.StarterKit.Communities, and the existing modules use the name of the module as the additional namespace qualifier (Faqs). 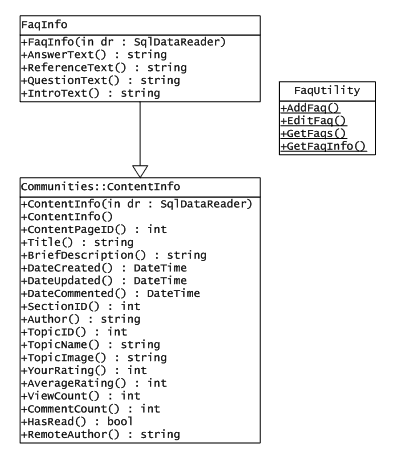 FaqInfo expects initialization with an instance of the SqlDataReader class. We will be writing the data-access code to create a SqlDataReader in our next class. Following the patterns set forth in the rest of the CSK, we will put all of our data-access routines into static methods of a utility class. There should be one static method available for each of the FAQ-related stored procedures (with the exception of the maintenance stored procedure, which we should not need to invoke during regular operations of the community site but only during setup). Each of these routines will need to map incoming variables to stored procedure parameters and execute the procedure. Notice that the AddFaq method also generates the search keys for the content using the SearchUtility class, and the newly created identifier of the content returned by the stored procedure we reviewed earlier. The EditFaq method almost duplicates the AddFaq method except for calling a different stored procedure and using EditSearchKeys on the SearchUtility class to update the FAQ search keys. One improvement you might consider making to the CSK is adding a try catch finally statement to ensure the database connection will always invoke the Close method, even in the face of an exception. The chances of an exception are small, but on a high volume community site, you cannot afford the opportunity to waste database connections. It is important for GetFaqInfo to use the return value and parameter list shown above. 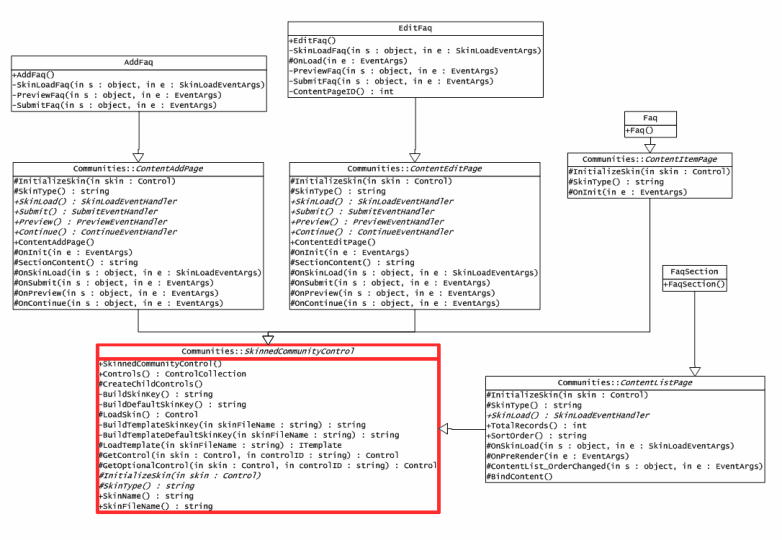 The framework should invoke these methods through a delegate and the signatures must match. We will see how this works when we write the content pages. Our data-access layer is now complete. If you build a module in this fashion, you should be able to compile the solution at this time to resolve any errors. You might consider writing a driver page to exercise the four static methods in FaqUtility and verify the results by looking in the Community_Faqs and Community_ContentPages tables of the database. The CSK breaks up the display of content into smaller controls. For example, under Engine\Framework\ContentPages\Controls, you'll find a control to display the content title (in Title.cs), and the content's brief description (BriefDescription.cs), which can display our FAQ question and the introduction. All we will need to add are a couple of controls specific to the FAQ module: a control to display the answer and the reference, and a control to provide a link for authorized users to edit the FAQ content. All of the controls at this level derive from the .NET Framework WebControl class. We simply need to set the CssClass property for our control, retrieve the text to display from the current HttpContext, and override the RenderContents method to write the text. The FaqReference control looks very similar to the FaqAnswer control. Both override RenderContents and use the CommunityGlobals class for proper transformation and formatting of the outgoing text. Generally, you will want to break each field of a new module into a specific control to use from a content skin. It is up to the skin designer to decide where to lay out the fields for presentation. With these small pieces built we are ready to tackle the actual content display. In the traditional ASP.NET paradigm, the content classes are the code-behind files. Since the CSK takes a slightly different tack to allow high levels of customization, we will not be able to use the IDE to keep our web form in sync with the code behind the form. No real tie exists between the two, since each code file supports multiple versions of the same web form (the skins). Instead, we will need to manually keep track of which controls are on the page, and manually wire up the events that we need. The task is not difficult but does require some extra attention to control names and other details. The amount of code you will need to write for a content class varies widely. 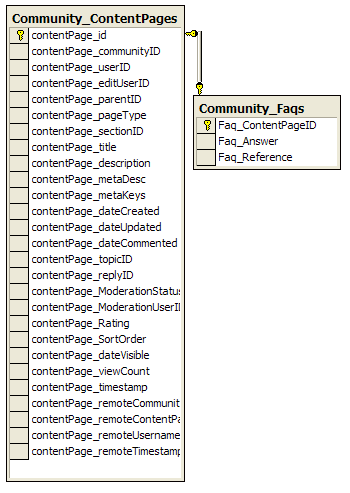 Using the ContentItemPage and ContentListPage CSK classes we can display an FAQ and an FAQ list with very little code. We will look at these two classes first. The FaqSection class derives from ContentListPage, which can do most of our work with just a little more of information. At this point, we need to pick the actual filename for our skin and set the SkinFileName property. This step is essential to SkinnedCommunityControl (the base class of ContentListPage) for finding the correct skin to load. When we wrote the data-access methods in FaqUtility, we mentioned the need to maintain a specific method signature of return type and parameters. The method signature we used was the one for a GetContentItemsDelegate delegate. The base class will use the delegate within the BindContent method to retrieve and display all the FAQs in a given section. The Faq class follows the same pattern, but initializes the skin file to Faqs_Faq.ascx, and assigns the delegate to the FaqUtility.GetFaq method. These two classes present a bit of a challenge. Since the data-access methods to insert and update module content vary widely from module to module, there is no base class available to reduce the workload through a delegate. Instead, we will need to find controls that are specific to our module to get and set values, and invoke the FaqUtility data-access routines in response to user events. In addition, we would like to preview the control, which requires five more controls for display instead of input. These five controls should be the same as the ones we will use in the display of an FAQ. So we will use the FaqAnswer control we wrote earlier to display the answer. Let us look at the EditFaq class as an example. The constructor initializes the skin file name and section content properties, which we will define later. The constructor then wires up event handlers for three events defined in the base class ContentEditPage. These event handlers will contain the logic for loading the skin, handling the preview button click, and the submit button click. They are a part of every content edit page. // continue initializing all controls with GetControl . . . When the page loads, we need to retrieve the information for an existing FAQ from the database. The CSK will pass the content identifier in the query string parameters, so we fetch the ID and pass it along to the GetFaqInfo method of the FaqUtility class we examined earlier. Once we have an FaqInfo object in hand, we can populate controls on the page (which we obtained references to during the skin load event) with FAQ information. When the user clicks the preview button, we need to shuttle all of the content in the edit controls to the preview controls, which will render the content with the styles we use to display content. This gives the author a better idea of how the content will look when the content goes live. The ContentEdit base class will take care of toggling the preview panel control visibility so the author can see the results. The SumbitFaq event handler uses the FaqUtility class to put the updated content into the database. Once this is done, we send the user off to the content page with a Response.Redirect to view the updated FAQ. The AddFaq page looks similar to the EditFaq page and can be seen in the code download. The only work left is in presenting the data via skins and style sheets. Make sure the filename for the skin matches the filename assigned to SkinFileName in the content page class. You'll also need to pay special attention to control names, as these must match the control names you search for with GetControl in the underlying class. Use this form to add or edit an FAQ. Note the use of a RequiredFieldValidator to ensure the FAQ will have a question populated. The ContentAddPage class will also expect a preview panel, which comes later in the Faq_AddFaq.ascx file. Text="Notify me when a new comment is posted"
In this skin, we use all of the web controls we built (including FaqEditContent which only displays links appropriate to the type of user viewing the FAQ). With the skins in place, we are only one step away from completing our new module. While building the skins and web controls for a module, keep track of the different CSS rule names you place into the code. The time has finally come to modify CSS files to put the new styles required by the module into place. Unfortunately, the CSK doesn't provide any default behavior for stylesheet selection, so you will need to place these styles into every stylesheet available to a community. Copy styles from an existing module and just change the names. Building a new module requires building on top of existing code in the CSK, so a good understanding of the CSK architecture is in order. By following the steps we outlined in the beginning of this chapter and following the patterns set forth by the existing modules, you can build a new module with the ability to search and rate the module content. It will also have all of the other cross-cutting functionality built into the CSK. In the next chapter, we will build a little more onto the FAQ module and take a look at other forms of customization in the CSK. Although building a new module requires a bit of code and time, the end result is a seamlessly integrated feature with the full support of the CSK comments, ratings, view counts, and more.